Crime in Stereo's third album pushing their punk origins into something diverse and accomplished. 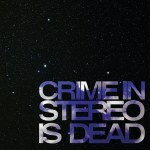 A punk album in the guise of a fancy art-rock package, Crime in Stereo’s Crime in Stereo is Dead is nothing if not well-designed. Included is an impressive booklet complete with hand-scrawled lyrics, the always classic black-and-white snapshot of lead singer getting swamped by fans at a live venue, along with an extra cover sleeve. Maybe the whole idea of it is a ruse; the band is abrasive, their lyrics a grab-bag of sharp metaphor-tweaking and heart-to-pen poetry depicting breakup angst and disillusionment. The music backs it impeccably, too, thrashing in cymbal-ringing glory or hovering reflectively with the turn of a phrase. Most importantly, Mike Sapone, the engineer of Brand New’s 2006 envelope-pushing tour de force The Devil and God are Raging Inside Me, is at the helm, creatively pushing the fivepiece beyond their comfort zone. Unlike the permanently downcast Devil and God, though, Crime in Stereo is Dead buzzes with youthful obstinance and just-around-the-corner optimism even as songwriter Alex Dunnes’ couplets are at their most dark (“Make the end come” he begs in album opener “The First Thousand Years of Solitude”). The stunningly forlorn “Orbiter” and twisted “Choker”, two cuts based around identical chord progressions at complete opposite ends of the group’s palette, provide a winning closing statement of how far they’ve truly come. Being dead has never sounded so fist-pumpingly diverse.